The Vaunn Medical Foot Stool is designed with one concept in mind "STABILITY". We want a footstool that offers maximum stability and durability like no others in the market. Purchase our product with confidence. We offer a full refund to your purchase if you feel that our product is inferior. Our limited lifetime warranty also guarantees our step stool to last forever too. The Vaunn Medical Foot Stool is designed with one concept in mind "STABILITY". We want a footstool that offers maximum stability and durability like no others in the market. Purchase our product with confidence. We offer a full refund to your purchase if you feel that our product is inferior. Our limited lifetime warranty also guarantees our step stool to last forever too. The Vaunn Medical Foot Stool is made of triple-layered chrome-plated heavy duty steel construction offering ultimate stability & lifetime durability to our users. It is voted the Number 1 durable footstool by doctors and professionals. Thanks to feedback from our customers, the Vaunn Medical Foot Stool now comes with a handle for added support. It's non-skid ribbed rubber platform and reinforced rubber feet also provides additional traction and security on any floor surfaces. Our high quality triple-layered chromium plating ensure that our product stays rust-resistant. LIFETIME DURABILITY - Triple-layered chrome-plated heavy duty steel construction offers ultimate stability & lifetime durability. The No.1 Durable Foot step stool Bathtub and Toilet Lift compared to standard steel or plastic stool. RUST RESISTANT - Newly designed with high quality triple-layered chromium plating ensure product stays rust-free lifetime. SAFE - Non-skid ribbed rubber platform and reinforced rubber feet provide traction and security on any floor surfaces. WIDER LEGS - Legs Diameters are made 1/4 inch thicker than standard foot stool in the market for increased stability. 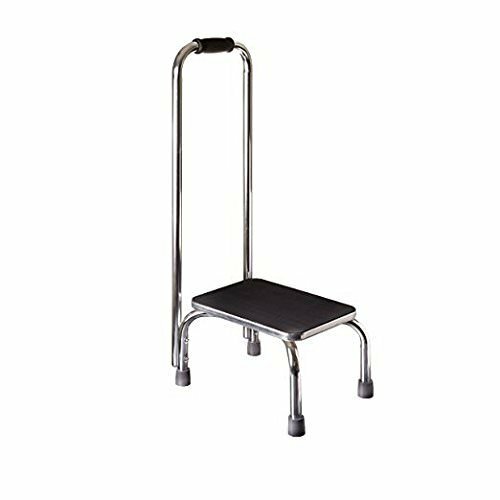 Drive DeVilbiss Healthcare 13031-1SV Foot Stool with Handrail, Width 14", Diameter 13"